Anytime you have to make a physical move, it can be a difficult experience. It is even more challenging if you are making a business move. It pays to seek out a commercial moving company who can help you with big move, provide you with insider tips and even help you with logistics if you will be making a particularly complicated move. Working with a company that has lots of options, such as a mobile storage company for your commercial storage in Seekonk, MA, can also make it easier. Being able to store some of your items while you are in the middle of the move can help simplify a multi-step move or store specific things while you get settled and make room for their arrival. Business owners should work with a professional company of Massachusetts movers who has experience working with commercial clients. A move with a residential customer will be drastically different than a move with a corporate or commercial client, so you want to make sure that the commercial moving company you choose has experience working with moves within your industry. For example, a move made by a medical clinic can involve a lot of special handling and insight into the protection required for delicate medical equipment. Another example would be a music store that has a lot of valuable pianos, guitars, drum sets and other equipment that requires knowledge by the commercial moving company on how to move them properly. One of the first positive signs that you are working with a professional commercial moving company is that they will help you with all of the planning and the scheduling. A good moving company will help you plan to move your entire business – the store, the office, the warehouse – and show you what things can be moved in advance to help minimize the downtime during transit. Even if you are moving to the other side of the state or out of the state of Massachusetts, movers should be able to help you plot out your entire logistical move every step of the way. Other suggestions, such as moving over the weekend if you run a Monday through Friday business, beginning the move Friday evening and getting everything unloaded and unpacked on Sunday evening or Monday morning, will give you time to get ready to be open for business. Moving after hours or starting a move when business begins to slow down in the evening are other options for seven day a week businesses. The more you can begin to pack things up during the work day or ahead of time, the easier it will be to just load everything up, transport it from A to B and allow you to unpack it in the morning. Assessing the Move: What Needs to Go? Another great sign of a good Massachusetts movers company is that they will send a consultant out to look at the things that you want to move and help you come up with a game plan. 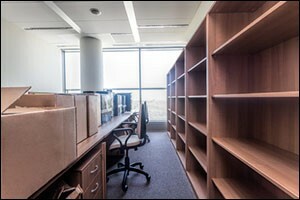 For an office with cubicles, they can estimate how long it will take to disassemble and re-assemble all of the dividers and breakdown all of the computers and set them back up again ready to go. A commercial moving company should have experience making an office move and be able to put everything back together just as it was without a hitch. Ask about mobile storage company services as well. If you have a lot of inventory, back files and records, extra furniture, holiday or seasonal items and anything else that doesn’t need to be unpacked or used right away, they can help. Using a commercial storage in Seekonk, MA to hold everything safely until you finally have room for it – or for a longer period of time if you need it – can be a life saver. This will help you keep your focus on the things that need to be moved immediately by the Massachusetts movers to ensure that you don’t lose anymore business time than necessary. Many moving companies will also help you wrap up and pack items that are difficult, such as electronics, computer equipment, expensive technology, flat panel screens and more. You can count on Conlon Moving & Storage for all of your commercial or residential moving needs in the Massachusetts area. Our commercial moving company has been in business since 1885 and has served the people of the South Coast region and beyond with all of their commercial, logistical and residential moving needs. Give us a call at 508-336-7766 to find out more about our professional services and our commercial storage in Seekonk, MA. We can help you make a commercial moving plan that will make sense and help you get back to work before you know it.